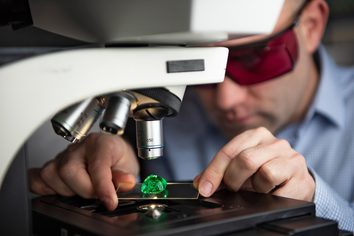 GRS GemResearch Swisslab AG is a private independent gemological research laboratory, specializing in the determination of origin and authenticity reports for ruby, sapphire, emerald and other important colored gem. Labs located in key global sites are equipped with the latest technology to recognize and identify today’s advanced gemstone treatments. Ongoing research and expeditions to the World’s most important mines are published in our own movie documentaries and "Contributions to Gemology".